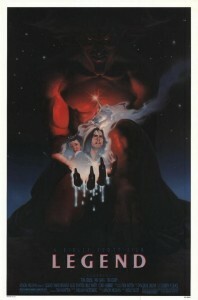 Please tell me you’ve seen at least one variation of Legend, Ridley Scott’s rather odd, charmingly dreamy and thoroughly divisive 1985 fantasy film starring a disarmingly fresh-faced Tom Cruise, the befittingly enchanting Sloane Peterson Mia Sara and a truly marvelous Tim Curry as Darkness, the wonderfully-realized physical embodiment of pure evil – an iconically fearsome figure brought to vivid life by the genius practical effects guru Rob Bottin with countless layers of prosthetics, latex, spirit gum and make-up (and all while he was already primarily preoccupied with his likewise legendary work on John Carpenter’s The Thing, impressively enough). If you haven’t, I certainly can’t promise you my forgiveness but you can certainly help your case and also do yourself a rock-solid in the process by doing so in the eminently foreseeable future – and redouble these efforts by doing so once more with the brand-spanking-new score that I will be quite justifiably shining a spotlight on shortly. Ridley Scott’s original cut of Legend was 125 minutes long; feeling that he could handily trim some fat and improve the flow and focus of his film, he trimmed it down by 12 minutes to a perfectly reasonable 113. At that point, the film ran through the test screening gauntlet somewhere in Orange County, Southern California where the resulting consensus was that the audience was somehow obligated to expend too much effort to simply enjoy the movie for what it was. Sir Ridley then cut the film down by nearly 20 more minutes to a fairly brisk 95. This particular incarnation of Legend was released in the U.K. on December 13, 1985 by international distributor 20th Century Fox. Scott and domestic distributor Universal Pictures then opted to ax a little more than 5 minutes more from the run time and the North American release of this new 89 minute cut – in other words, it was now pretty much the actual length of all the Disney animated classics of which it was originally envisioned as a live-action reinterpretation. Anyway, Legend was then pushed back to April 18, 1986 after the questionable decision was made to completely discard the late, great Jerry Goldsmith’s 6 months-worth of classical compositions (kind of a big deal considering the fact that Goldsmith would usually work only 2 1/2 months on any given film, at most) and hire the popular West Berlin-bred electropop group Tangerine Dream to concoct a new soundtrack in an effort to make the film more hip, commercial and edgy enough to connect with young American audiences and help increase those all-important box office prospects. And so the only version of the movie widely available Stateside was the heavily-truncated, Tangerine Dream-scored cut until the year 2000, when Universal Pictures discovered a fairly well-preserved print of that 113-minute-long OC preview screening cut (1 of only 2 such prints of that extended version in known existence) set to Jerry Goldsmith’s original traditional score. That print was fully restored and remastered, with some finished shots from the super-short American theatrical release digitally extrapolated and inserted into it to smooth over a few rough patches and rectify some unfinished elements. This new edition of Legend became Ridley Scott’s preferred version and was officially christened his Director’s Cut and subsequently released for the very first time by Universal on a sweet 2-disc Ultimate Edition DVD set in 2002 that was eventually awesomely rereleased in high-definition on an even sweeter Ultimate Edition Blu-ray…needless to say, I can proudly boast of the presence of both of these editions in my own home video collection. Anyway, so basically there are now 2 distinctly different cuts of this cult classic featuring 2 drastically different original scores which in turn offers viewers 2 wholly unique viewing experiences very easily accessible for ideal home exhibition but now there is yet another way to watch and enjoy this particular diamond-in-the-rough and it’s all thanks to the bizarrely brilliant and blazingly original comedic performance artist Reggie Watts…. Doing what he always does with his signature brand of unquantifiable aplomb and using only the sound of his own voice, selected sound effects, 3 synthesizers, a few digital looping devices and an especially effective and memorably funny Tim Curry impression, this prodigiously talented man somehow managed to improvise and record a full 1 hour and 31 minutes of score…LIVE, as the original American cut silently unspooled at the Roxie Theatre as part of the annual San Francisco Comedy Festival. This bold new soundtrack of his then went on to make its big debut in an unsurprisingly sold-out show at SXSW in Austin, Texas. It’s fresh, freaky, funny, fantastic and, as of about one week ago, downloadable…FOR FREE! Oh, yea. No joke. Pretty pretty pretty damn good deal if you ask me. All you have to do is pay a visit to Mr. Watts’ official website RIGHT HERE, RIGHT NOW, submit a valid e-mail address in the little white box and the full feature-length soundtrack is instantly made available to you in MP3 file format so all in all, this is an absolute no-brainer decision and quite likely the best, strangest and most ambitious thing to greet your eardrums in quite a long while. So get out there and acquire a copy of Legend for yourself on either DVD or (preferably) Blu-ray (it can be yours forever on the cheap in both formats), take a couple hours out of your overly-busy and oppressively humdrum real world schedule, properly sync this thing up to the quickie cut and get blissfully lost in a filmic fantasy land you won’t soon forget – with the singularly sensational Reggie Watts as your magical forest spirit guide. And would some brave and intrepid filmmaking soul out there please make it her or his mission to hire this dude to score their new film and break some serious musical ground on film already?